I have said that spreading false rumors in time of epidemic costs lives. People have asked me how. Let me first explain how the Tuskegee Experiment cost lives. 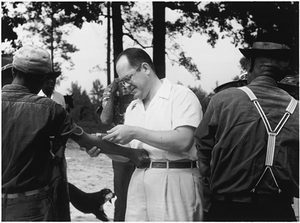 A group of US Public Health Service scientists at Tuskegee recruited a group of patients with syphilis. Before penicillin was widespread, syphilis treatments tended to kill people and didn’t work well; they conducted an experiment to see if people were better off without them. So they began an experiment treating a group of 399 syphilitic men with placebo, that is, a fake treatment that had no real effect. All of the subjects in the study were black men. This, plus the institutionalized racism in the United States in that time period, is crucial to what follows. 15 years into the study, penicillin had been shown effective, and had become the standard treatment for syphilis. The researchers should have halted the study by then and given their subjects the effective treatment; instead, with the agreement of the AMA, the CDC, and Tuskegee University, they lied to them for 25 years, as the patients continued to infect their wives and children, died young, and went insane. The study was halted immediately when the press found out in 1972; a Congressional investigation was called, and medical research changed a lot. The Tuskegee Experiment cost about 140 lives directly. Reporting on it probably saved some lives by ending the experiment early, and may have saved hundreds more by preventing other such depraved experiments. You can read more in the Wikipedia Tuskegee Experiment article or the CDC’s Tuskegee web page. But those 140-or-so murders are not what I’m talking about; there was another way in which it cost many more lives. It turns out that a lot of black people didn’t trust the US government public health programs that had been trying to encourage them to use condoms, not get pregnant when they were HIV-positive, and distribute clean needles for heroin addicts in their neighborhoods. In fact, a lot of them thought that both HIV and these public-health measures were efforts to exterminate black people. The Tuskegee Experiment was strong evidence that such a thing was possible — and it was by the very same agency, showing that its people lied and killed and could not be trusted. Perhaps some of the higher AIDS prevalence in the black population was due to other reasons: worse health care, lower circumcision rates, poverty, whatever. But some of it was a direct result of this distrust. Let’s say a third, conservatively. Nearly everyone who had AIDS in 1991 died of it. This distrust cost the lives of over ten thousand people from AIDS: perhaps a hundred times worse than the direct death toll from the Tuskegee Experiment itself. There are similar distrust problems with recruiting African-Americans for clinical trials or organ or bone marrow donation. So let me suggest an alternate universe: one in which the Tuskegee Experiment never happened, due to researchers having a higher ethical standard than in our own universe, or perhaps due to an effective oversight system of IRBs like the one that was put in place in 1972, after Tuskegee came to light. Suppose, in this universe, someone imagined the story of the Tuskegee Experiment, and created a widely-believed hoax about it. Suppose that this created the same distrust in the 1980s that the knowledge of the actual Tuskegee Experiment created in our universe. And in that universe, at least ten thousand more African-Americans would have died of AIDS, just as in the real world. In that universe, the creators and repeaters of this hoax would be responsible for the deaths of ten thousand innocent people. Now consider our own universe again. We are facing a flu outbreak. It seems most likely that it started at an overcrowded pig farm in Veracruz. I estimate it has about a 40% chance of going pandemic, a 59% chance of fizzling like SARS, and a 1% chance of something else entirely. It’s in a critical stage right now; in the next month or so, it could go either way. Maybe, like the 1976 Fort Dix flu virus, it’s not as dangerous as the 1968, 1957, and 1918 viruses. Maybe it has no chance of going pandemic, regardless of what we do. Or maybe it’s so contagious (and we’re so mobile) that we’re going to suffer a worldwide flu pandemic regardless of what we do; we can only mitigate its severity, not spare any place. Or maybe it does matter. Maybe it’s still contagious in few enough places that the right prevention measures can cause it to fizzle out before touching most of the population, where it might flourish in their absence. If we can stop it, we can save not just the tens of thousands of lives that were senselessly wasted in the African-American AIDS epidemic, but millions or tens of millions of lives. If the pandemic is possible but not inevitable, it won’t be stopped by individual action. It can only be done by entire countries, united, acting rapidly to take preventive measures: wearing facemasks, washing hands, not shaking hands, using alcohol hand sanitizer gel, social distancing, soldiers going on leave instead of living in barracks, administration of antiviral drugs like Tamiflu to those in affected areas, quarantining travelers and the sick, and so on. Maybe it will turn out that experimental use of OX40-Ig or something stops the damn thing from drowning you in your own plasma. In the US, there is a system in place for taking such decisive united action on issues of public health. It depends on the government: the CDC, the PHS, FEMA, the TSA, and so on. They have to decide what to do; there’s no system in place for democratic deliberation about these issues. But once they make their choice, they can’t implement it without the trust of the population. Of course, if it happens that the government agencies are corrupt and unconcerned with public welfare — especially if they were actually complicit in creating the problem, as they were in New Orleans after Katrina — there is no hope for such decisive action. Suppose, though, that the agencies actually do try to take effective action against a flu pandemic. Suppose that, unlike in 1976, their action is necessary and sufficient to keep this damn thing from taking off. But suppose there are a bunch of hoaxes floating around. Hoaxes that claim, say, that the virus was created in government laboratories and then released — on no factual basis, with no plausible theory of motivation, and no plausible explanation of how such a thing was possible. If people believe such hoaxes, the agencies will find themselves unable to act — paralyzed by the distrust of the public. And the hoax will kill millions, or tens of millions, of people. Did the person do a thorough investigation before making the material public? For example, if they’re putting a surprising interpretation on something a public official said, have they contacted the official’s office to ask for clarification? Does it contradict other things you know? For example, if it asserts without comment that “programs of mass vaccination are already being prepared”, while the CDC’s web site and the New York Times claim that the CDC has developed seed stock but has not yet decided whether to deliver it to vaccine manufacturers, it’s probably nonsense. Have you found the person (either the forwarder or the original source) to be unreliable in the past, writing or forwarding things that turn out to be false? Is the original source obscured — e.g. just a person’s name, with no URL, email address, or other contact information, or explicitly anonymous? Does the person believe in other highly improbable theories, like the Time Cube, extraterrestrial lizards controlling the world, creationism, homeopathy, the idea that vaccines are ineffective and a conspiracy of silence among all doctors to poison our children, or that Barack Obama is secretly a Muslim? Maybe their judgment isn’t very good. Does the person propose conspiracy theories without exploring the plausibility of the motivations? For example, proposing that a flu virus capable of a worldwide deadly pandemic was intended as a biological weapon — even though it would inevitably devastate the friends and family of its designers — isn’t a credible conspiracy theory, unless you also propose that the designers are collectively suicidal. Does the person propose theories of conspiracies that would be implausibly difficult to keep secret? For example, a conspiracy involving dozens of public health officials from a variety of politically-unfriendly countries would inevitably get ratted out fairly soon. Do they fail at basic assessments of human behavior probability? For example, given the choice between the explanation that some lab technicians cut corners on safety procedures when manufacturing a flu vaccine, and the explanation that evil upper management instructed the evil lab technicians to try to create a deadly flu virus mixture and sell it as vaccine, possibly killing millions of people (including the families of the management and lab technicians) in a global flu pandemic in order to sell more flu vaccine, do they think that the second one is plausible? Do they fail to link to their sources so you can’t find their errors, particularly when the sources are already public? Do they occasionally point to manifestly irrelevant information in support of their thesis? Maybe they’re borderline psychotic and are struggling to maintain any semblance at all of coherent thought, or maybe they just think you’re stupid and will be impressed by a lot of words. Are you thinking of forwarding something that includes pleas that you should forward it, especially urgent ones? That probably means the material wouldn’t have been forwarded to you on its own merit. The latest version of this is “PLEASE RETWEET”. Does the person who wrote the information have a vested interest in getting it widely distributed — for example, do they run a site covered in banner ads, make a living as a writer, or sell self-published videos or books on their website? Do they spend a lot of effort on self-promotion? If it turns out that it’s false, would it hurt someone to distribute it? It’s not so bad to forward around a funny kitten photo that turns out to be fake, but in the particular case I’ve been writing about, it will at least damage the reputations of some innocent people (who ought to sue you for defamation, but probably won’t), and at worst kill hundreds of millions of people. If a few of these red flags pop up, don’t just forward the thing. Investigate it first! By Kragen Javier Sitaker, @kragen on Twitter. Originally posted to kragen-tol in April 2009. Edited a bit after that for clarity and photos, and to complete an incomplete sentence. I was surprised by how popular this article has turned out to be; several thousand people have read it now. I would be delighted to have translations of this article into other languages, but I don't speak any other languages well enough to do a good job. Please email me (include my last name to distinguish your mail from spam) if you prepare such a translation and you would like me to link it here.